Custom contours fit any pitch, all major metal roof profiles, for either ridge cap application or roof-to-wall applications. 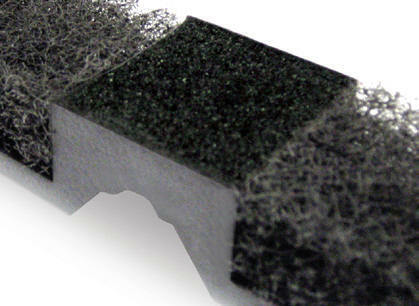 LP2™ creates a low-profile look and a seal that helps keep out moisture. Python™ is a single-layer, non-fabric-covered ridge vent re-cycled material made from silicone-coated fibers that prohibit clogging. This strong, durable, modified polyester allows the greatest air flow in and out of the attic. Moisture, net free area and pest-free seal. The special cut contours plus a 2" Marco closure create an incredible WEATHER TITE™ seal to help keep out moisture, insects, dust, and plant materials. The contours give this system a WEATHER TITE™ fit, and to the roof a non-obtrusive appearance to the roof. Excellent air flow means your metal structure stays cool while the heat escapes and adds up to reduced utility costs. LP2™ comes with a double bead of industrial strength adhesive. One person can simply remove the peel and stick strips to apply LP2™ to the metal roof, then secure the ridge cap over the LP2™ with fasteners or nails. It’s that easy! When properly installed with soffit or intake vents, LP2™ is building code compliant. For those looking for a ventilation system to provide the ultimate ventilation benefits at a cost lower than traditional fans, turbines, and louvers, the WEATHER-TITE™ LP2™ RIDGE VENT removes heat and moisture, prevents rot, extends paint life, limits mold growth, ice damming, and reduces excessive heating and air conditioning costs. The product is made from the non-fabric-covered Python™ vent recycled material. 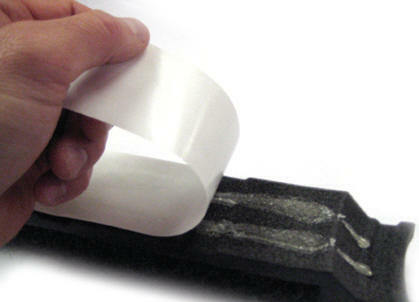 This strong, durable, modified polyester is a non-woven, non-wicking, fiber-based matting. Its special cut contours are designed to provide a custom, low-profile fit for any pitch and most major metal roof profiles. These features add up to a superior net free ventilation area that still helps keep out moisture, pests, dust. Plus, LP2™ can be installed by just one person in two easy steps. In fact, the screw bed and industrial strength peel and stick adhesive pre-applied to LP2™ makes this one of the easiest installations imaginable. The LP™ system improves attic ventilation, eliminates condensation, and is easy to install… a fitting combination that’s hard to beat.